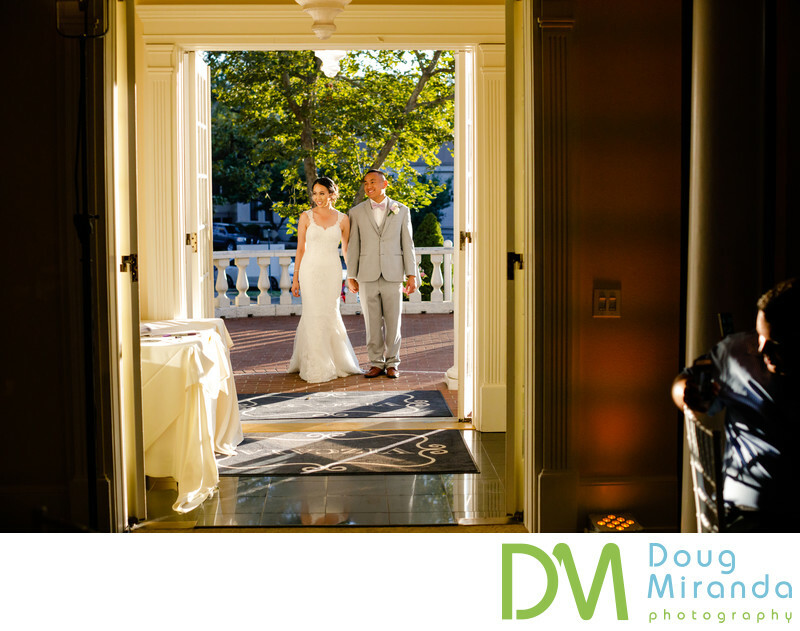 This newly married couple is out front on one of their grand balconies at sunset on a hot summer day. The key to sunset photos and especially on hot days is to be quick with taking the pictures. Couples at this point of the day have already had tons of photos taken of them, so most of the time they're over it. I usually only spend about ten to fifteen minutes or even less when taking sunset portraits. Then when you mix in a warm summer day, you need to be quick and get them back into the air conditioned reception room. Vizacaya Sacramento is one of the premier wedding and event venues of the city. The property is located in downtown Sacramento and is easy to get to from the freeways and city hotels. It’s grounds are stunning with historical mansion that is the getting ready area from the girls and guys. The bride and her bridesmaids have access to the middle floor parlor and back room salon. While the groom and his groomsmen will be stored away downstairs in the basement, which has been turned into a giant man cave. This will keep the men occupied for sure. Behind the mansion is the back courtyard where all the outdoor ceremonies will take place. They are able to handle indoor weddings and those take place right next door at the elegant pavilion. The giant pavilion is where your reception will be taking place at. You will enjoy your dinner, speeches, dancing and all of your guest on your wedding night. Your cocktail hour will take place on the back patio of the pavilion. Everything is with in a super short walking distance. In between the mansion, courtyard and pavilion are immaculate gardens. These locations are great for photos and staying in the shade during the hot summer months. Out front of the pavilion your guest are greeted by two large stone staircase and their trademark fountain. The property dates back to the 1890’s and is loaded with history. They have been making wedding dreams come true over the past 20 years.